Installation of the direction (orientation) and angle (inclination) is without a doubt the most important aspect of solar water heater panel performance, as these two angles will affect the solar water heater collector’s efficiency and performance. Before we can consider where to place the solar water heater collector, we need to understand the path of the sun in relation to a fixed point on the earth. The sun, as we know, moves across the sky as a result of the rotation of the earth. The sun rises in the east and sets in the west and throughout the day travels in an arc across the skies. During the summer, the sun is high in the sky and in winter, it is low in the sky. This is a result of the inclination of the earth surface either towards the sun and/ or away from the sun as the earth rotates around the sun. Therefore, rays of light from the sun hit us more directly during summer, making the sunlight warmer and more intense. In the winter the sun is low in the sky. The rays of light are spread more thinly and they do not warm us as much. You can observe this with a small torch: hold it straight above a piece of paper and trace the edges of the lighted area. Then hold the light the same distance from the paper, but at an angle, as if it were the sun low in the sky. The lighted area is much bigger, even though distance of light has not changed. A larger area of the paper has to “share” the light and heat, so no part of the paper will get as hot as if the torch were overhead. This is why the collectors really perform best between 10am and 2pm when the sun is almost at right angles to the surface of the solar geysers collector. Outside of these times, the sunray’s surface area is smaller and is at more of an angle and much of the radiation is reflected off the glass. It stands to reason that for a solar geysers collector to perform optimally: the surface of the solar geyser collector needs to be orientated in the direction of the sun, on the suns path and incline towards the sun. If we are to have the full face of the solar geyser collector orientated or inclined directly towards the sun throughout the day, we will have to move the solar geysers collector as the sun moves across the sky. This can be done; however, it becomes a very costly and technical exercise. The simplest alternative is to fix the solar geyser collector in a position where it is orientated and inclined towards the path of the sun to receive maximum radiation throughout the day. For optimum performance, the collector must face the sun when the sun is at its highest and therefore strongest. This being 12 noon. To achieve this, the collector should be orientated to face the equator. So, in the southern hemisphere, solar geyser collectors should face true north and in the northern hemisphere, solar geyser collectors should face true south. South Africa is in the southern hemisphere. Therefore, for optimum performance in South Africa, the solar geyser collector should be orientated to face true north. 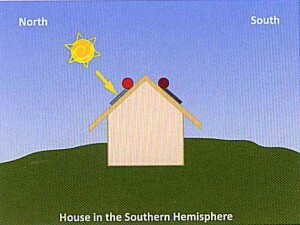 The diagram clearly shows that a solar geyser collector orientated towards the south on a house’s roof in the southern hemisphere will get very little solar radiation. 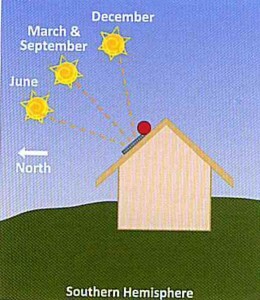 As we have learnt, during the summer months the sun is located high in the sky (thus longer days), while in winter months it is low in the sky (thus to maximize the amount of sunlight falling at the right angles on the solar geysers collector, solar geysers collectors should be inclined up from the horizontal the same number of degrees as the angle of latitude. For example Pretoria’s latitude is 25.7 degrees and therefore, the solar geysers collector must be inclined 25.7 degrees for optimum inclination performance. By inclining the solar geysers collector to the same angle of latitude as the location, at midday, the face of the solar geysers collector receives the sun’s radiation at right angles to the solar geysers collector – summer and winter solstices (i.e. the equinox on the 21stof March or September, when day and night are equal length).shorter days). We need to tilt the solar geyser collectors to receive the full face of the sun as the sun’s angle changes throughout the year. By adjusting the tilt of the solar geysers collectors continually, this can be achieved. However, again it becomes a very expensive and technical exercise. 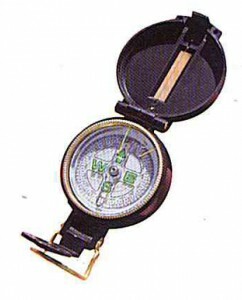 We generally measure north with a compass; however, this gives us magnetic north and not true north. 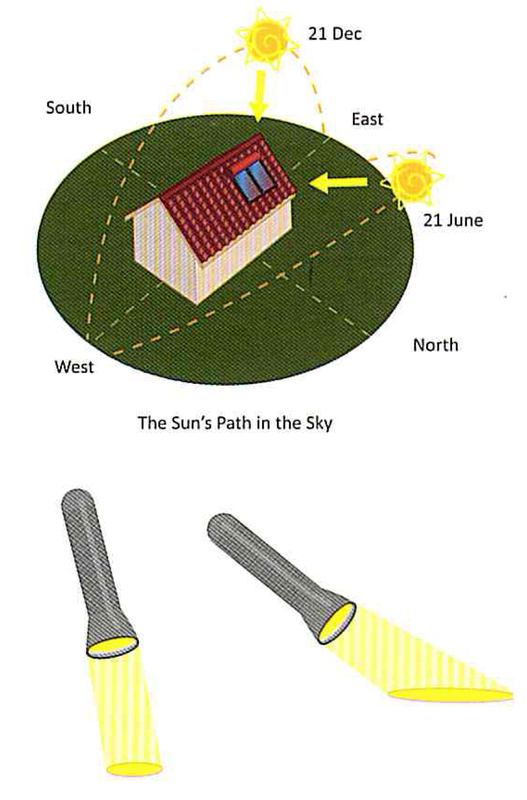 This is important, because the sun moves across the sky in relation to the position of true north, not magnetic north. In South Africa, the difference between true north and magnetic north (declination) is between 15 and 25 degrees west of north. Using an average declination of 20 degrees for South Africa would be adequate for facing of the solar system to true north and will have little effect on the system performance.